Coming Soon! Click on the "Email Me" button above to be notified when this knife is in stock! "The Emerson Combat Axe is nothing new. In fact it is over 1000 years old. 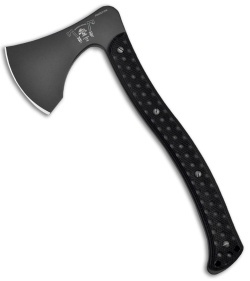 I upgraded it and redesigned an ergonomic handle style but the axe itself is a one-to-one copy of an actual Viking battle axe from my collection. With a grip-tite G-10 handle and perfect balance in the hand it is formed from S-7 Tool Steel and is up to any level of destruction you intent to create. I coated it in a steel-grey cerakote to help prevent staining so it can be used in the most extreme of environments. It’s not too heavy. It’s not too light. It’s just right. I think a Viking Berserker would agree. I think you will too." Information from Emerson. More info coming soon!